Sometimes, deconstructing a classic dish can yield entertaining results. 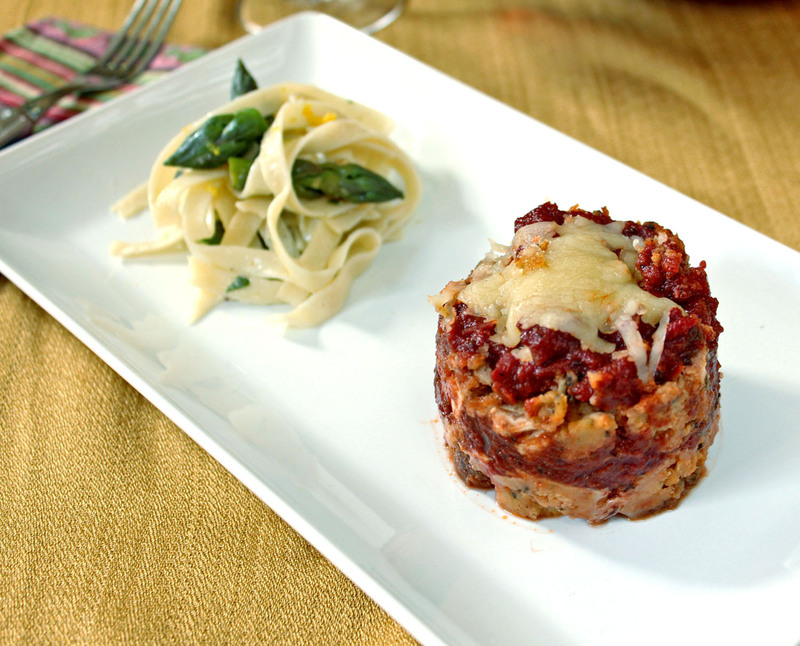 Chicken parmesan, with basic and fresh ingredients, is a simple gem no matter how it’s plated and an easy midweek meal to prepare. Bolton Orchard, our local farm market, sources local meats and poultry from area farms that are scrumptious and unique. The plump chicken breasts are a real favorite as they are extra meaty, and with the natural benefits that smaller organic farms can deliver. As I architected the presentation of this dish, the unpredictability and controlled chaos of deconstructivism filled my head, and I felt a postmodern painter being channeled through me with complete clarity. Even without the gourmet presentation, this recipe always hits the spot. Homemade marinara sauce is the only viable option for me, versus packaged products that are overly processed and come with enough sodium to sink a battleship. This recipe adds a pinch of heat to the sauce from the red pepper flakes, which balanced the lemony pasta and sweet asparagus from our garden. Any way you slice it, or present it, good food starts with a simple and fresh philosophy and with equal parts determination to make it distinctive. Season chicken on both sides with salt and pepper. Place flour in bowl and season with cayenne. In separate bowl, beat the eggs. In third bowl, mix the panko, garlic powder, oregano, parmesan, and season with salt and pepper. First dredge chicken in flour on both sides, then coat with egg on both sides allowing excess to run off. Then place in panko mixture and coat both sides pressing firmly to ensure crumbs adhere. Transfer chicken to plate. In skillet on medium high heat with olive oil, add chicken and brown for 2 minutes on both sides. Reserve skillet for pasta sauce. Transfer to baking pan, and bake in oven for 30 minutes. Remove from oven and let rest. NOTE: To serve, slice chicken and layer in a cooking mold, then top with cheese and tomato sauce and repeat to make tower. Place mold on foil and bake at 350°F to warm and melt the cheese. Bring pot of water to boil, add pinch of salt and then pasta. 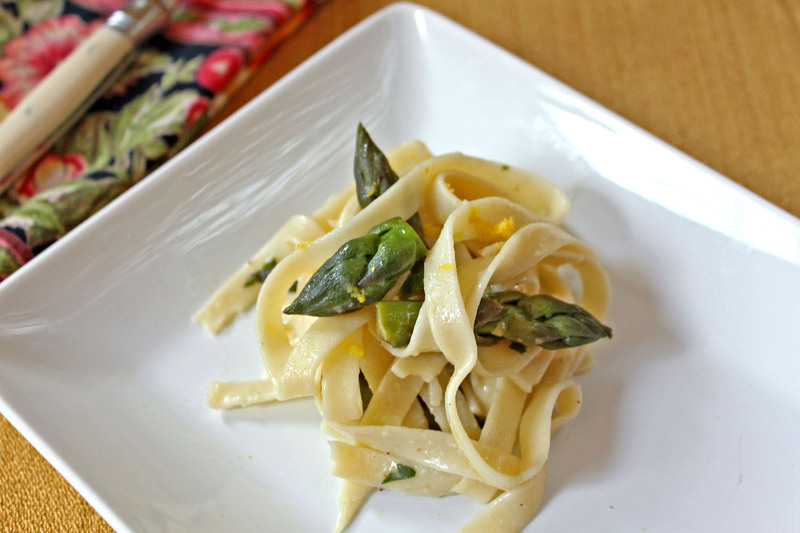 Cook pasta until just before al dente, remove from heat, and then add asparagus and let rest 3 minutes before draining. Remember to reserve 1-2 cups of pasta liquid. Return pasta to pot and add lemon zest, parsley and parmesan, then set aside. In same skillet from sautéed chicken, sauté garlic and shallot in 2 teaspoon of olive oil for 2 minutes, then add butter. Add flour and cook for 2 minutes stirring to make a blonde roux. Whisk in reserved pasta liquid and season with salt and pepper. Add more liquid if necessary for a thick but fluid sauce. Remove from heat and whisk in sour cream and season to taste. Sauté garlic, onion, and spices until softened, then add Roma tomatoes and wine. Stir in crushed tomatoes and simmer for 1 hour, stirring occasionally. NOTE: We use professional Third Pans for preparing the chicken. They are inexpensive and helpful to reduce mess, as you can stack them easily next to each other, versus bowls or plates. This entry was posted in Cooking, Main Dishes, Spring, Summer and tagged Pasta, Poultry by cfaust. Bookmark the permalink.